I walked into class earlier this week and asked one of my ten-year-old students why she had been absent the previous class. She told me she had gone to the dentist, but her classmate quickly added, "She cut her tongue". I asked her why and she told me it would help her speak English better, and insinuated that my Korean co-teacher had said it would help her pronounce 'S' better. This student has never had any noticeable problem pronouncing English words (it's her shyness that hampers her more than anything), so the fact her parents would do something so unnecessary left me shaking my head in disgust. Actually disgust was what I felt after I asked to see the result (she was pretty blase about the whole thing, saying it had only hurt for a day or two) and saw the stitches under her tongue. If (and only IF) you want an idea of how this looked, there's a screenshot from Park Jin-Pyo's short film "Tongue Tie", (which I mentioned here) that has documentary footage of a frenectomy (specifically, the tongue being stitched) here (it's not for the squeamish). Linguists sneer at the idea that South Koreans' tongues are too short to speak English properly, pointing to the unaccented speech of hundreds of thousands of Korean Americans. Jung said the operation takes as little as 10 minutes and can be done as outpatient surgery with local anesthetic. It usually costs $230 to $400. Actually, though I didn't ask, she responded to a classmate's comment saying that it cost 120,000 won. Who knew that dentists were doing it? On the topic of plastic surgery, an article about plastic surgery in which women have their calves sliced to give them thinner legs can be found here. "feeling that anyone considering plastic surgery should be required to see a surgery, be present for one and really experience how gross it is to cut open a human body and fiddle with it", reveals an unpleasant fact about plastic surgery. Also related to this is an excellent post he wrote about the "kind of absolute horseshit that female interns have to deal with" within the medical culture here. A high school student, Yu Na-yeong, 18, shot an 18-minute drama called "Michuhwanmong" ahead of graduation. It is the story of a girl worrying over the fact that she has "single-lidded" eyes, or without a crease in the lids when she opens them fully. Yu had watched the mainstream movie "200 Pound Beauty" with some of her friends. In the movie, an obese woman was reborn into a beauty after undergoing full-body plastic surgery. Then she managed to reconcile with the "past" and succeeded in work and love. About the movie, Yu commented, "The movie has received some favorable criticism that it does a good job of addressing the social problem of an appearances-first attitude, but I felt that it encouraged plastic surgery." For young girls, plastic surgery is not extreme, said Yu. It is considered natural that teenage girls would undergo a surgery to obtain "double eyelids," she explained. 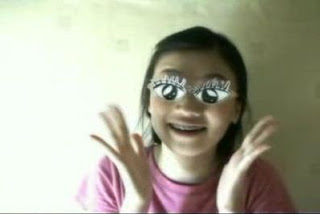 "After taking the college entrance examination, many girls got plastic surgery, at least to get double eyelids. Teenage girls have a strong desire to overcome their appearance-related complexes, instead of valuing their individuality." The Korean Womenlink, a women’s rights organization, conducted a survey of 1,648 South Korean female middle and high school students about how they evaluated their appearance. According to the survey, just one out of 10 respondents, or 13.7 percent, was satisfied with their appearance. About 43.6 percent, or 718 girls, were totally unhappy about theirs. It's one thing for these girls to feel inadequate themselves; it's another when their parents project this onto their children, as they certainly do with the tongue operations, and which they must have done when I saw a ten-year-old student with bruised eyes who had just had eyelid surgery, something that made me feel pretty nauseous. And yet she treated it like a joke, saying, "Look into my eyyees" in an exaggerated voice and giggling. In response to my post about Gang Hye-jung's plastic surgery, Iceberg commented, "She used to be so pretty. Now she's just...ordinary." I think that hits the nail on the head. In Korea, plastic surgery-enhanced faces are ordinary, and getting plastic surgery is "considered natural." It's as Korean as kimchi, the four distinct seasons, cyber terror, and cakeboxes full of money. Inside, it's not a large restaurant; there's only room for six tables. In the picture below, the mirror on the opposite wall helps to give an idea of the space inside. And here's the chueotang itself, which was delicious, before I added the noodles on the left and the green onions just off to the right. 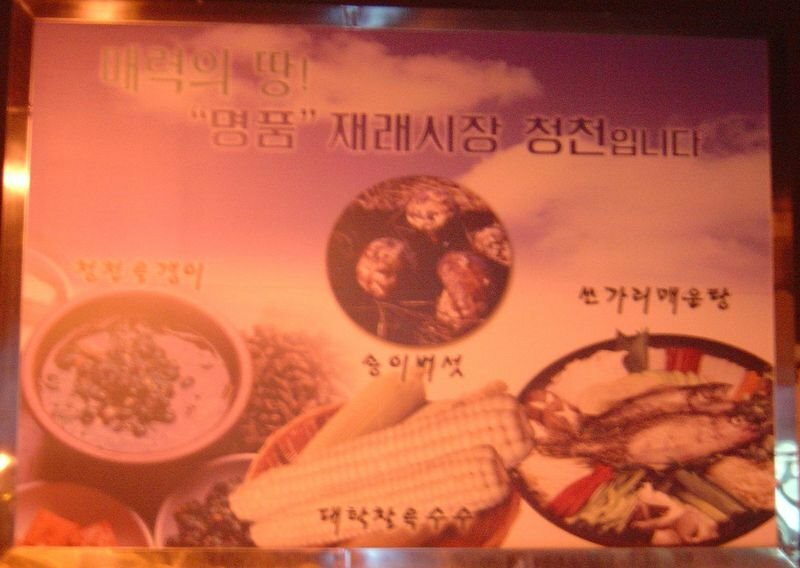 The mudfish were essentially the consistency of paste, with the soup also consisting of mushrooms and tofu. It was tasty and filling, and something I look forward to having again in the near future. After dinner we headed north of Jongno into the narrow alleyways hidden away there. On weekdays Jongno's office workers keep this area busy, but on weekends it's very quiet. 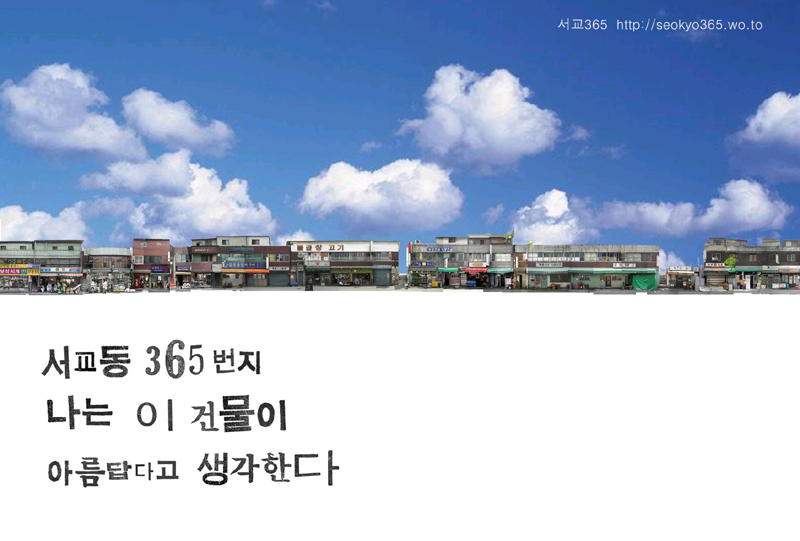 The name of the exhibition was "Seogyo-dong 365 - I think this building is beautiful." 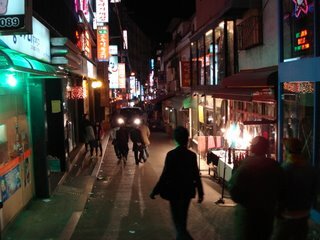 The building and address in question refer to a narrow strip of buildings which essentially run down the middle of the street in Hongdae which runs between (and parallel to) the street the subway station is on and the street which runs in front of the entrance to Hongik University. I've been told that this is essentially the last strip of these older buildings in the area. When I first saw them over five years ago, they contained a lot of restaurants and tiny, almost anonymous "Soju-beer-hof" places. Over the past three years dozens of tiny clothing shops have taken over the southern part of this strip of buildings, but despite this gentrification the area still retains its charm (and in fact one of my favourite haunts in Hongdae can be found here). Keep in mind that this excerpt shows only a quarter of the composite photo (a tiny version of the exhibition can be seen here). What's remarkable is the way in which the two long photos, one for each side of the strip, generate an identity for these buildings by allowing us to see them all at once, as a whole. The viewer is given both a sense of space and place, and it certainly gave me a new appreciation for these buildings. More can be found out about this at their website, http://www.seokyo365.wo.to/ (which seems to work best with IE), which also helps to give a sense of the community surrounding these buildings. There you can find pages with photos which help to give you a sense of where these buildings are, while this page gives directions to the cafe where the exhibit is being held. 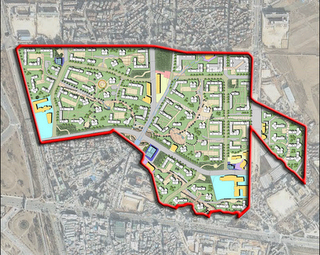 Is the city, with its massive redevelopment plans (Cheonggyecheon, 50 New Towns, it's new park corridors) really going to let a 5 km long park touted as the 'New Daehangno' sit surrounded by villas and houses dating from the 1970s and 1980s? I think not. What do you think they mean by New Daehangno, anyways? 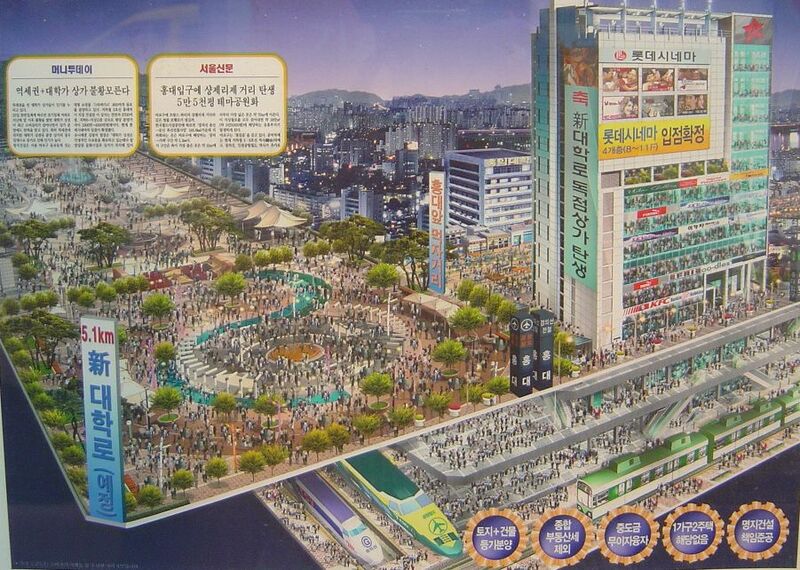 I don't think of parks when Daehangno comes to mind, I think of cafes and bars (ok, and theatres) and consumption. I imagine this park space will be surrounded by loads of commercial space and perhaps a few officetels (okay, maybe a lot of them). I'm rather certain this is going to become another cash-cow for the developers, and the scene below is only the beginning. Hongdae is one of those places that gets touted for its club scene in magazines and newspapers catering to foreigners (while providing fodder for the local tabloids due to the mix of Koreans and foreigners, but that's another story). Does the city really think Hongdae will become more attractive to the eyes of foreign tourists (or even its own residents) by making it look exactly like something they'd see back home? At some point people will look back at some of these lost neighbourhoods and regret their disappearance - all too late. Many people have, of course, but it's just not a point of view that gets much airtime or sympathy from those with the power to knock things down and build them back up, and those people have too many dollar signs in their eyes to see beyond them. 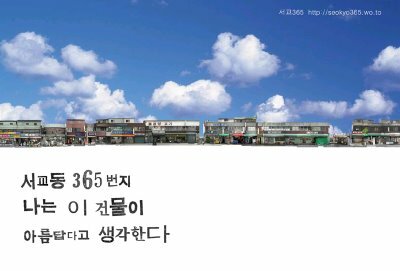 Kudos to those responsible for the Seogyo 365 exhibit, which exists at an intersection of art, architecture and protest. I linked to the directions to Cafe Sukara above, and also pointed it out on the satellite map. The exhibit finishes next Monday (the 29th), but if you have a chance, do stop in, grab a coffee, and have a look around. Oh, it turns out the Hankyoreh has an article about this exhibition (in Korean). The Joongang Ilbo often posts long articles in English which are quite good, and one I just read one titled 'The silent, deadly curse of bullying'. It looks at a 21 year-old woman who was bullied for years in middle and high school, and who is now a councellor for bullied children. I could dig up lots of other articles about bullying in Korea, but I'm sure anyone familiar with Korea has a pretty good idea of how nasty it can be here. Contributing to this is the fact that, unlike many children who are bullied in the west, who have at least a friend or two, childen in Korea who are bullied are often totally ostracized, as no one wants to be associated with them for the fear that they, too, will be targeted by bullies. Another factor is the institutionalized violence prevalent here, especially in the school system, which lead the victims to simply 'shut up and take it,' and often not even try to fight back. I'll be delving into this topic more in the near future. The article is here. I've been looking into the development of Banghwa-dong, where I live, for awhile now, but I've amassed so much information it's hard to know where to start. 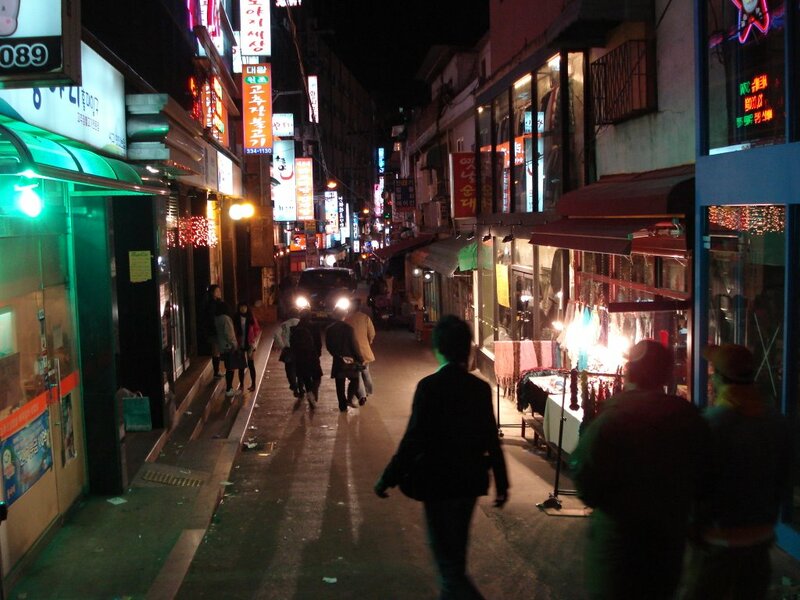 Banghwa-dong is in Gangseo-gu, and is located next to Gimpo Airport; Banghwa is also the last stop on subway Line 5. Its northern part is nestled between Gaehwasan and Chihyeonsan, which overlook the Han River to the north. I'd taken a lot of photos over the past few years but one thing I'd never looked into much, even though I quite like them, was how to turn them into panoramic photos. Well, kudos to Lost Nomad, who mentioned a little program called ptgui, which I've been using to make panoramas out of dozens of older photos, as well as pushing me to great heights (literally) to try to capture the cityscape I call home by taking some new ones. Here is the neighbourhood as cobbled together from Google Earth. A few landmarks as well as the vantage points for the following photos are marked on the map (in yellow and red). Like any photo here, it can be clicked on to enlarge it. In the foreground at left is an apartment complex dating from the late 198os (as many in the area do), while the taller (rebuilt) complex behind them is three years old. To the north of those, and including the large complex in the center of the photo, are the apartments completed in the mid 1990s, which were built on former farmland (these were finished in anticipation of the completion of subway Line 5). To the south of the street running away from the intersection at the center of the photo is a neighbourhood dating from (likely) the early 1980s. 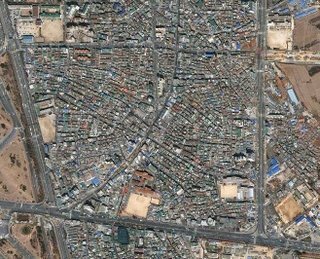 A great many 'pocket' developments (where an apartment complex is built amidst older housing) can be found there; beyond it is Magok-dong, the four square kilometers of fields which lie between Banghwa-dong and the rest of Seoul. Those fields resemble what the northern part of Banghwa-dong would have looked like 15 years ago. This apartment (the one on the right) was a hole in the ground when I first moved here, but quickly sprouted up to block out the view (it's interesting to look at my older photos and see what a different landscape was visible before). Now, this apartment complex can also be seen on the right hand side of the right hand photo below, while to its left is the apartment building which appeared in the center of the first wide panorama above (as seen below in the left hand photo). 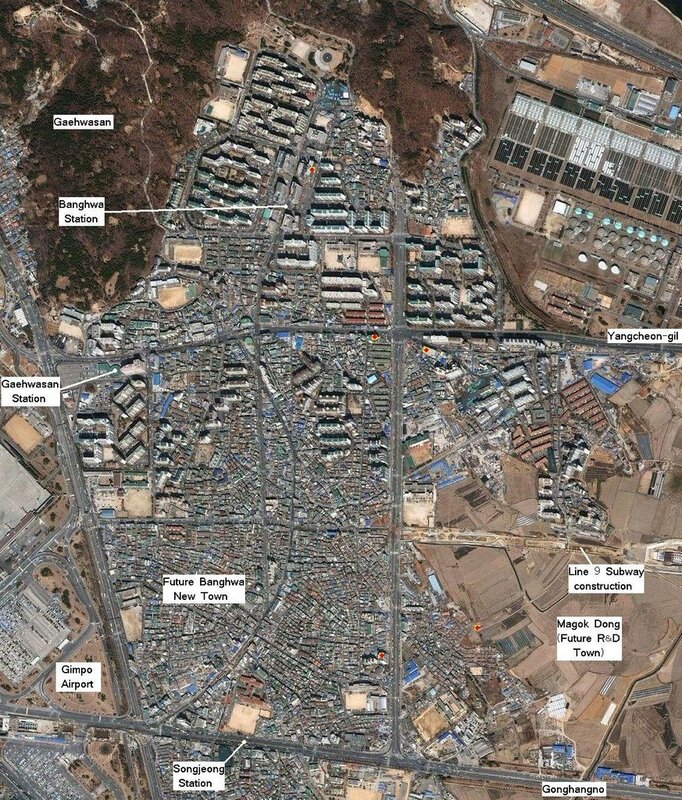 The photo above on the right is a close-up of the one below, which was taken from about 700 meters to the south on the other side of the fields that make up the Magok-dong area. The line of construction running in front of the buildings is for the new subway line. To the right of the apartment buildings a small mountain, Gungsan, can be seen, and behind it, Bukhansan. 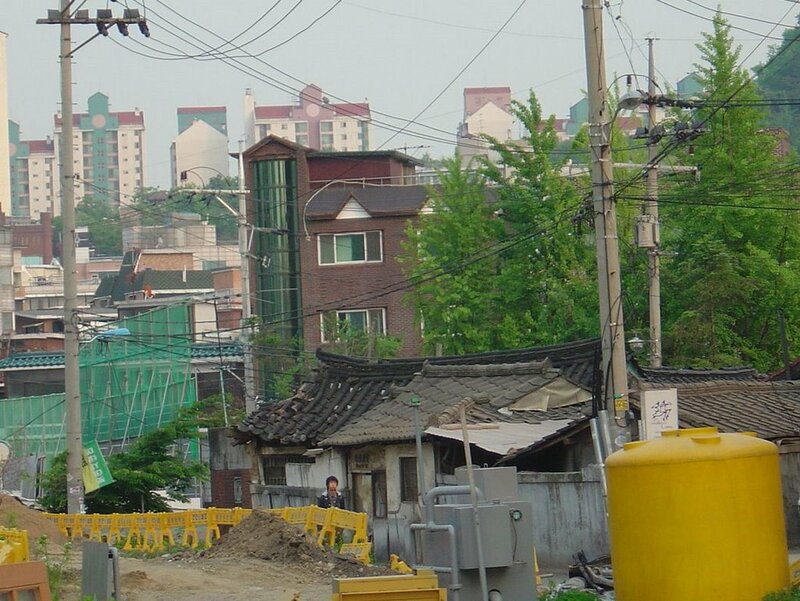 To the right of the mountain is Gayang-dong, which is full of apartment buildings also built around the same time as those in the northern part of Banghwa-dong. In front of Gungsan (a former Baekje-era fortress) is what was once the center of the area, Yangcheon; the elementary school there dates back to 1900. I often go for bike rides around the Magok area, which is often a peaceful place (though you can still hear the traffic in the distance on Gonghangno). These fields, along with the two mountains to Banghwa-dong's north, make Banghwa a place where nature is less than a half hour's walk away. It's too bad that these fields will soon disappear to make way for the Magok research and development city. They've been on the chopping block since Kim Young-sam's presidency, and at this point the land has long since been bought up by the government. It'll likely be over a decade before it's all developed. 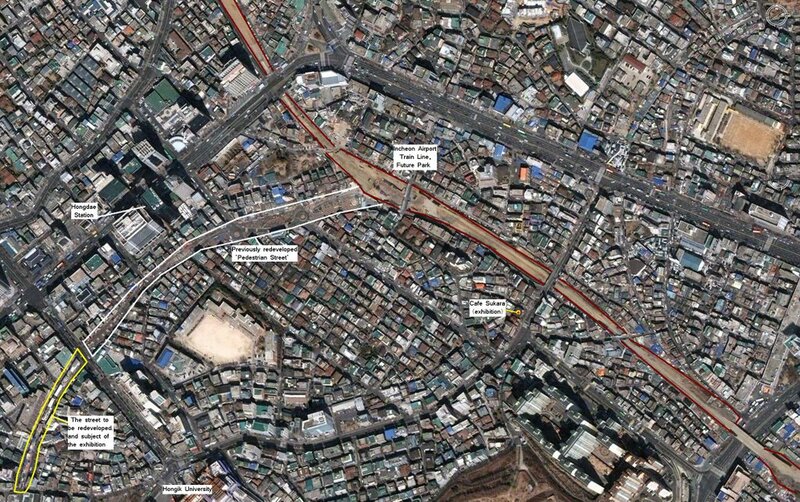 The 'peak' at the far left is the top of Gimpo Airport's international terminal (now mostly a shopping center), while the peak at center is Gaehwasan; Chihyeonsan is visible at right (it's currently having a tunnel bored through it to connect the (new) street at right to the Banghwa Bridge and the Gangbyeong expressway). At top right is an apartment building that should be familar by now. This photo should give an idea of the appearance of the area to be developed. There are numerous villas built across this area, as well as several low apartments dating to the early 1980s. There are also a lot of houses, and some of the owners I know aren't very pleased at having to move. Across the horizon in the distance are the newer apartment complexes; prior to their building in the early 1990s, most of Banghwa-dong looked like what we see in the foreground, or like the fields we saw above. Above is a photo taken by my friend Matt in the area near Banghwa station, looking east (Gungsan is actually visible on the horizon, two kilometers away). What's interesting is that you can see Chihyeon Maeul (village), which was the town that once sat nestled between Chihyeonsan and the fields these apartments overtook. There's been a few pocket developments within the village, and I imagine the area will disappear over the next decade. 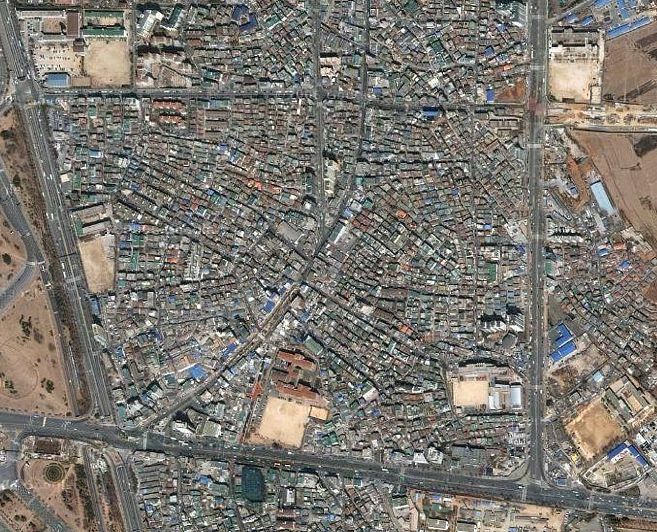 Of course, once the new town is finished in 5 or so years, in that time even more 'pocket redevelopment' will have occurred, making most of Banghwa-dong unrecognizeable from how it looked in the early 1990s. 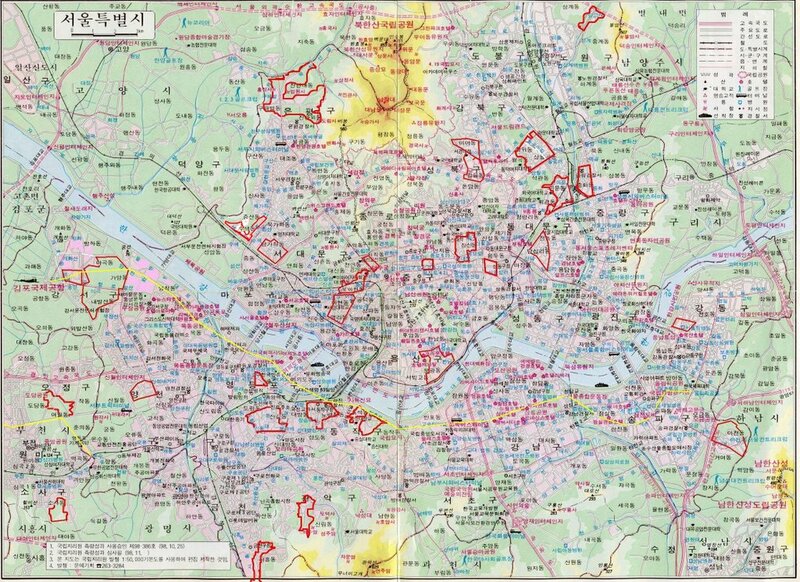 Of course, there are many areas in Seoul which will be able to say the same, especially once the 25 new towns are finished (with 25 more to come, some of which will be massive). 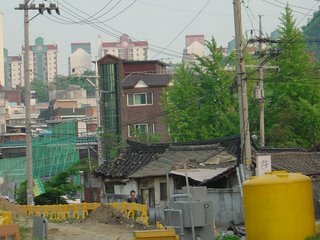 Another planned new town is in Sillim-dong, and Antti's post about visiting Sillim-dong and taking photos in the area to be redeveloped has convinced me of the need to do the same in southern Banghwa-dong before it's gone. Seoul blood soup: This is made of blood jelly and ox bone. The most well-known neighborhood for haejang soup restaurants in Korea is Cheongjin-dong, in Jongno district, Seoul. 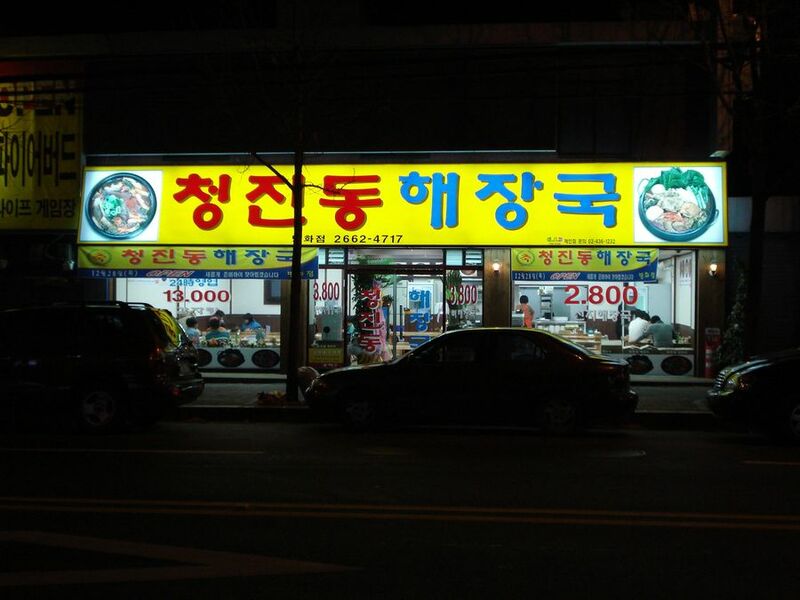 Despite its fame, now there are only a few haejang soup restaurants open. 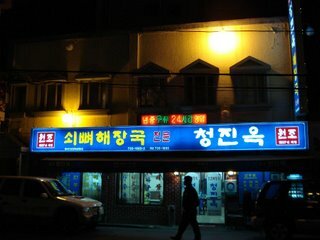 A blood soup restaurant called Cheongjinok is the oldest establishment. Some customers slice the blood jelly and eat it while drinking alcohol. 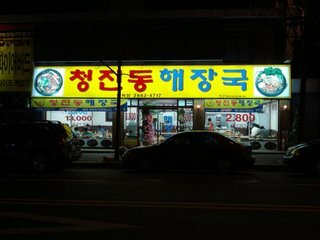 According to Choi Jun-yong, 38, a third-generation restaurateur, when Cheongjin-dong was at its peak in the 1970s and '80s, there were over 10 blood soup restaurants there. The area sees more customers in the early morning than late at night. 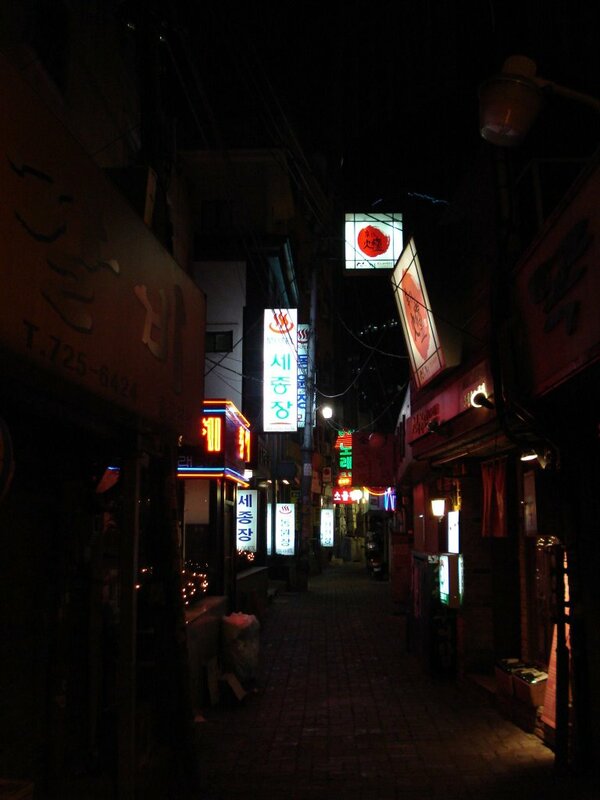 Cheongjin-dong's haejang soup neighborhood was created in the late Joseon Dynasty. There was a market selling firewood nearby, and restaurants opened to serve the buyers and sellers. To make the soup, ox bones are first boiled for 24 hours to make a stock, then rice, blood jelly, outer cabbage leaves, green onions and pig's intestines are added. The soup is usually served in an earthenware bowl. Goesan marsh snail soup: A refreshing green soup made of chewy snail meat. Marsh snails are called olgaengi (marsh snail) in the Chungcheong provinces dialect. They are called godi in the Gyeongsang provinces and daseulgi in Seoul. The marsh snail lives in fresh water and usually hides under rocks. Of course, every town has to have its specialties, and Cheongcheon's are olgaengi, a soup made of tiny shellfish, maeuntang, corn, and mushrooms. I didn't get a chance to try the last two, but had the Olgaengi soup that night. It wasn't bad (it contained a bit of deonjang and vegetables), but the flavour didn't really endear itself to me. Just in case it sounds like I have a dislike for all things haejangguk, I can assure you I do not. 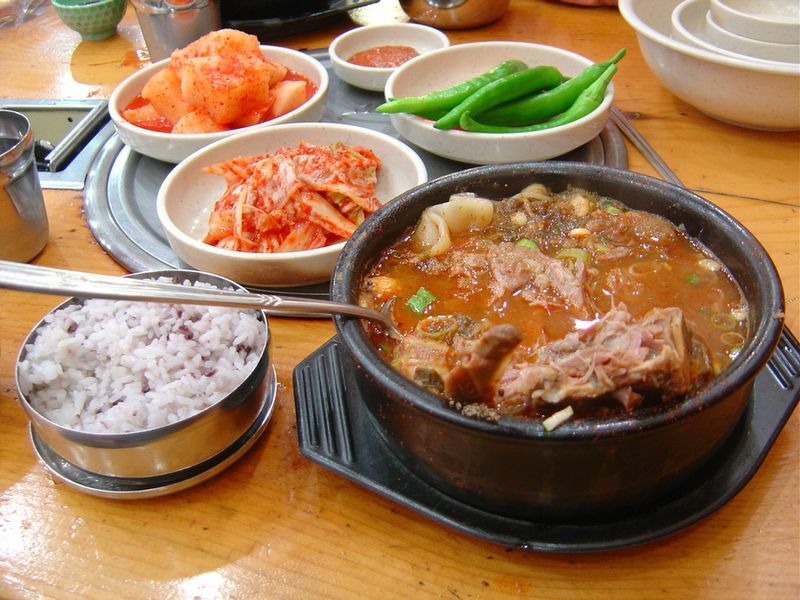 One of my favourite foods in Korea is Byeodagui (뼈다귀) haejangguk, or as a friend likes to call it, 'neckbone soup'. 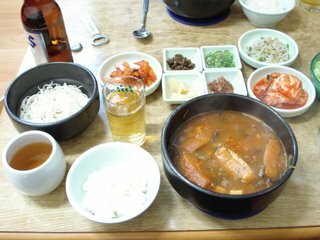 There are four of these restaurants within a ten minute walk (of course, the best place is furthest away), and not a few long nights have ended lazing about on the warm ondol floor eating this hearty, mouth-watering soup. For the life of me, I can't understand why this wasn't mentioned in the article. 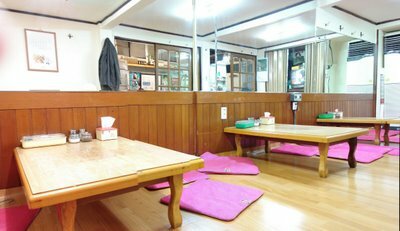 Something else worth mentioning about haejangguk restaurants is that they're open 24 hours, so they can be enjoyed at any time. Since I'm on the topic of food, the best news of the month in that regard has been that a barbeque chicken place has opened nearby, and serves a yangnyeom (spicy) chicken dish that tastes exactly the same as the best chicken restaurant in Korea, a similar place near Bucheon station which I sometimes visit just to eat the chicken - and now I can get it two minutes from my house. 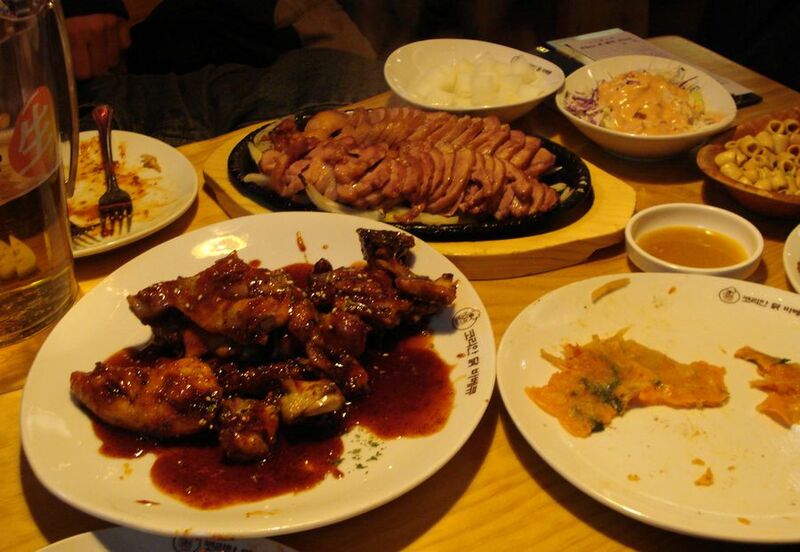 Yes, there it is, along with some smoked duck and complimentary (and tasty) gochu-jeon. Not meaning to quote LG's north american ad campaigns, but when you're sitting in front of this, Life's Good. I watched Invisible Waves awhile ago and was impressed to see Gang Hye-jeong had a small role in it, speaking English with Asano Tadanobu (easily my favorite young (er) Japanese actor) on several occasions. Gang pulled it off well, and made me think that these kind of roles in arty films with pan-Asian casts (made in varying quantities by Hong Kong, Chinese, Thai, Korean and Japanese filmmakers) might be something she could do well, allowing her to become more familiar to audiences in other countries. 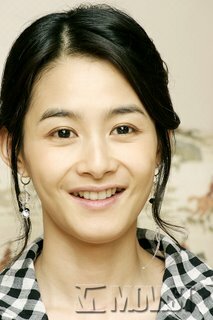 I was first captivated by Gang Hye-jeong when I saw her in her first film, the science fiction/art film Nabi (Butterfly), back in 2001. She's not 'beautiful' in the way that most Koreans would define it, but that's precisely why she stood out. Shock and disbelief where quickly followed by disappointment; she's given up her own brand of beauty so she could look just like the typical pretty faces you see peering out of magazines, billboards and tvs everywhere. Her most marketable asset - her uniqueness - is gone. What a complete and utter waste. I didn't realize how far behind I was on this until I saw this post (from April) over at Psychedlic Kimchi, appropriately titled, "The miseducation of Gang Hye-jeong". That title gets to the point, as being overly self-conscious about their bodies is something I've seen among even young elementary school girls. Unfortunately, I know a "You're not fat" from me is going to be drowned out by several dozen messages that day from various other sources, some of whom are their teachers or even their parents. Kim Ah-jung says that it was easy to throw herself into the character when she heard people on the street murmur they felt sick looking at her with the special disguise on. The movie confirms what a lot of surveys say _ good looks can open a lot of doors in this society. One recent survey shows 80 percent of 1,133 Korean employees nationwide would be willing to consider getting plastic surgery for that reason. About 80 percent of public agencies and 85.4 percent of private companies required job applicants to submit a photo and personal information _ including their height and weight. The regulations will target government ministries and public servants first, followed by private companies. "We will also make efforts to change people’s basic attitude toward women. Patriarchal stereotypes and the widespread ``lookism’’ aggravated by the mass media are the major reasons for the discriminatory recruitment practice,’’ the official said. Perhaps the desire to "change people’s basic attitude toward women" is part of what led to this campaign? First of all, a facelift alone costs from 21.5 to 24.5 million won _ this includes fixing jaw, chin and nose for 14 million won and eyelid surgery for 3.5 million won. Also, getting rid of a double chin or under-chin fat costs 4 million won. The other makeover, from the chin down costs at most 35.5 million won. Liposuction of the abdomen, thighs and arms would generally cost 1.6 million won _ taking up the largest portion of the surgery. Then comes a 9 million won operation to make the body smooth and elastic. After all this is through, it will take at least three months to recover from these sort of operations and start one’s life as a thin and glamorous woman, doctors say. I have no idea if the movie, a comedy, criticizes this idea. For a film that challenges unnecessary surgery, do watch Park Jin-pyo's short film "Tongue Tie", which is about cutting the flap of skin under the tongue so as to allow children to 'speak English better.' 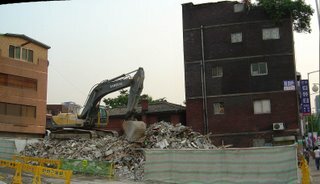 This is something I saw in one of my kindergarten students years ago (living in Jung-dong, in Bucheon, one of the first 'new satellite cities' around Seoul), something a friend described as 'rich people mutilating their children'. The film uses actual footage of a tongue operation, and is not for the squeamish; it ends with quotes from children about how much they hate learning English. The short film can be found in the omnibus film "If you were me", which was funded by the national human rights commission. 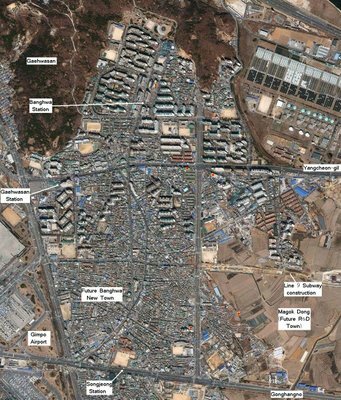 Above is the plan for the Banghwa New Town project, which will see 490,616㎡ (half a square kilometer) of older housing demolished and rebuilt from the ground up. It's just one of 25 planned new towns (with 25 more to come). Among the inhabitants, I wonder how many more people who have undergone plastic surgery will be living in the completed new town, as opposed to those living there now? Made-over neighbourhoods for made-over people keep the clinics and construction companies very, very happy.